A steam boiler engine and workshop outside an abandoned gold mine on the Colorado Front Range. 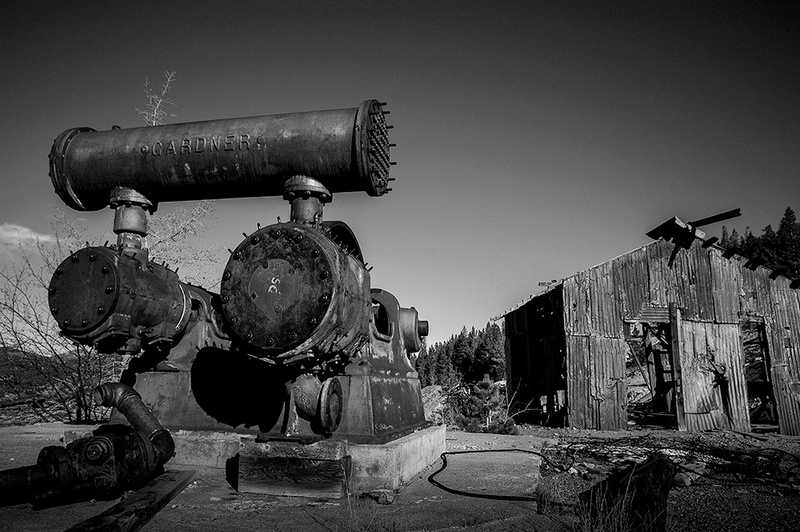 I have seen the Gardner brand of engines at old mines all the way from Alaska to New Mexico. Gardner must have had quite a monopoly on the industry back in the day. they look massive, must’ve caused a racket back then when it was operational, great shot. I love your composition. Beautiful black and white. Nice, like the textures and the dark b&w tone. Actually this is a two stage air compressor, the large cylinder on the right is the low pressure first stage and the smaller cylinder on the left is the high pressure second stage. The tank joining the two over head is an intercooler to remove the heat generated by the first stage compression. Gardner was the forerunner of Gardner-Denver a well known air compressor manufacturer. That’s why you see the name at many mines. Power most likely would have been supplied by a steam engine driving the large belt wheel you can just see part of above the low pressure cylinder.